ElasticPress 2.5 has been released, with a new Facets feature that makes it easy to add high performance content filtering controls to a website. A new Facets widget enables site administrators to add taxonomy facets to a sidebar (or any widgetized area). 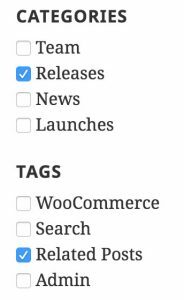 When viewing a content list (WordPress “archive”) on the front end of the website, each widget will display the name of the taxonomy – e.g. “Categories” – and a checklist with all of its terms. Visitors can narrow down content by selecting terms they are interested in, across one or many taxonomies. The Facets feature can be globally configured to narrow results to content that is tagged with any or all of the selected terms. The widget’s front end output contains carefully named CSS classes, so that designers and developers can apply unique styling. ElasticPress Facets empowers our adopters to take full advantage of the Elasticsearch query engine, including our tuned ElasticPress.io hosting, which makes complex queries like these lightning fast. ElasticPress 2.5 is our “1.0” for faceting – we will be iterating in greater controls and configuration options in future releases. ElasticPress 2.5 also includes a number of smaller enhancements and fixes, including official support for Elasticsearch 6.2, and increased functional parity with the WP_Query API.